Degas, Impressionism, and the Paris Millinery Trade, currently on show at the Fine Arts Museum of San Francisco, explores this infatuation which inspired a visually compelling body of work that subtly documents the effect that hat-making had on turn of the century Parisians, from working women to high society men and everyone in between. 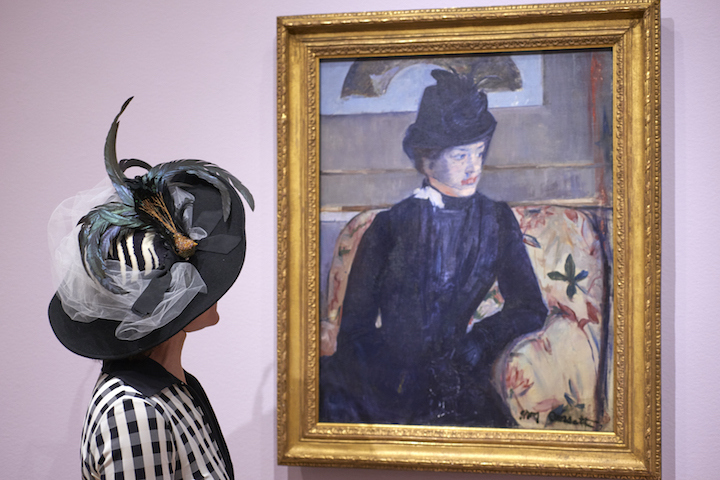 The exhibition is comprised of 40 exemplary paintings and drawings by French Impressionists including key works by Degas, Edouard Manet, Mary Cassatt, Pierre-Auguste Renoir, and many other masters alongside spectacular examples of period hats. For the visitor, this display provides a unique social and historical perspective of the millinery trade - an opportunity to explore the intricate layers of social, economic and gender meaning behind the production and wearing of hats during this time period. In Paris, already considered the fashion capital of Europe, hats were one of the early symbols of prominence and luxury. The bigger and more decorative hat, the higher your social standing. 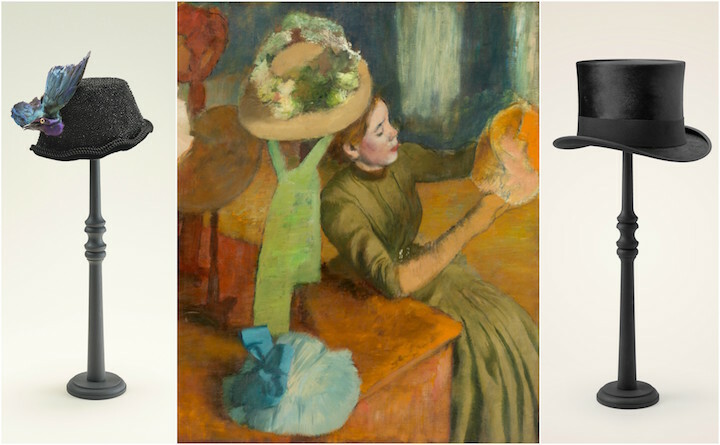 Degas himself explored the theme of millinery on no less than 27 canvases each of which reveals something about women, fashion and life in Paris at the turn of the twentieth century. The Millinery Shop (1879-86), Degas’s largest painting on this subject, shows a woman sitting around six hats, perhaps in a Paris hat boutique. The hats dominate the composition and offer a glimpse of the wide range of materials – ribbons, feathers, flowers – and colors – cream, oranges, greens – used in making the stylish hats of the era. In the same hall as The Millinery Shop is a hat from the same time period, lavishly embellished with ribbons, bows and silk flowers, that could have been taken directly from Degas’ masterpiece. The importance of the millinery trade for women cannot be understated and many of the paintings in this exhibition hint at their roles as both creators and consumers of these beautiful accessories. The Shop Girl (1883 – 85) by James Tissot brings you into a Paris hat boutique where a woman, presumably having purchased a ribbon for a hat, is about to make her exit through a door held open by a shop girl onto a busy street filled with men and women donning hats. The millinery trade, as demonstrated by this image, helped employ and adorn women. The hats signalled social status for the upper-class women who wore them and provided a living for the throngs of working class women who produced and sold them. Men’s hats were more subdued in material and colour than most women hats but were, nonetheless, an essential part of urban attire as they implied masculine privilege. Working class men would wore bowlers which also conferred a bohemian status on artists and intellectuals. Top hats began to appear in the 1870’s for the middle and upper classes and were considered formalwear by the 1890’s. 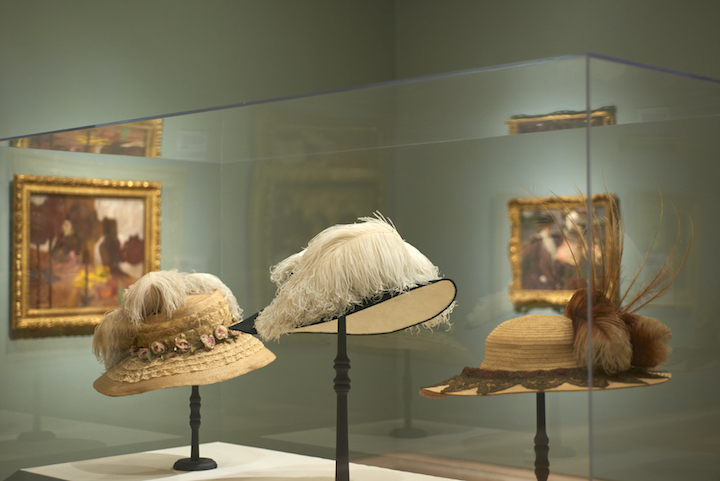 Organized by the Fine Arts Museum of San Francisco and the St Louis Art Museum, this exhibition is an unmissable opportunity to experience beautiful works of art, by Degas and his fellow Impressionists, that capture the social and cultural importance of these fabulous fashion accessories.